Generally, instant messaging is a text-based tool that allows users to conduct conversations online by exchanging short messages in near synchronicity over the internet. 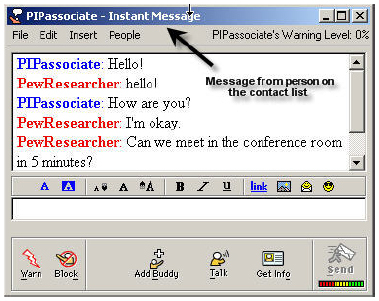 Instant messaging, often abbreviated IM, allows users to know which other users are online and connected via a particular instant messaging program, (a feature known as presence), and depending on the system in use, gives details about others buddies’ availability. IM software programs offer a number of features for users. Buddy lists, or contact lists, and away messages are the most common functions provided by all programs. Other special features include customizable backgrounds, environments, emoticons (symbols that convey the mood of an IM sender), and avatars (images created by the user as a representation of himself that are displayed while the user instant messages with others). 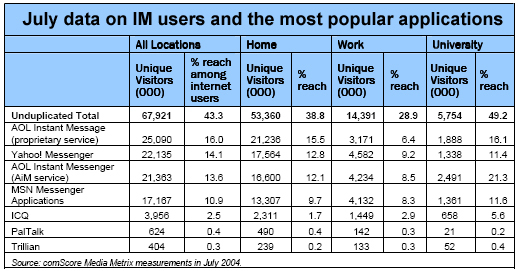 The most popular IM software programs such as AIM, Yahoo! Messenger, and MSN Messenger are mutually exclusive, meaning that users subscribing to a particular IM program can communicate only with instant messengers who use the same software. Contact lists, therefore, are limited to only those users who IM on the same network. In recent years, software developers have created IM programs, such as Trillian, Odigo, and Omni, that facilitate open instant messaging. Subscribers to open instant messaging programs can combine contact lists from different IM programs and communicate with all users. Originally devised as a way for users to hold real-time conversations online, instant messaging software programs have expanded their repertoire to include file-sharing, playing games, streaming audio and video, avatar management, and sending text messages to cell phones. Online men and women use IM in equal proportion. Just over a third of each group have IM-ed. This is consistent with previous readings of IM use among genders. In general, younger Americans tend to be the biggest IM-ers. Nearly two-thirds (62%) of Generation Y (18-27 year olds) internet users have sent instant messages, and 20% do it on a typical day. This reading is confirmed by other patterns found in a survey the Project conducted in February 2004. Americans with less than a high school degree compared to those with more education use IM in greatest proportion (64%). Although this pattern is directly opposite typical readings about internet application adoption and education, it confirms the findings that more young Americans, including students still in college, are using instant messaging. 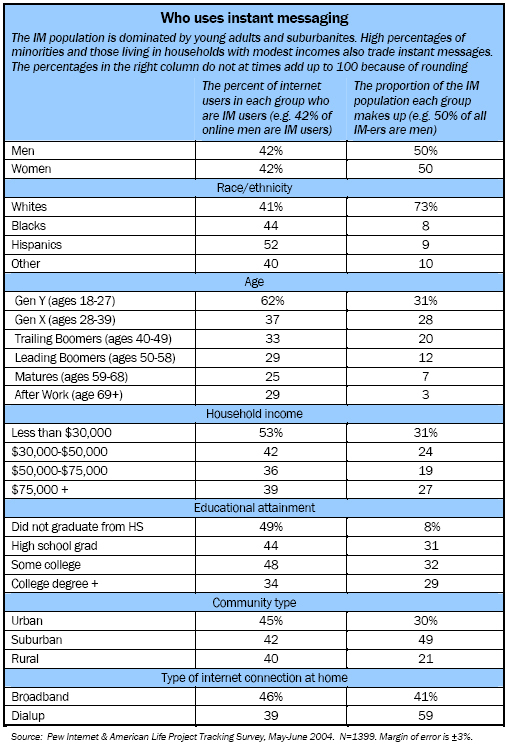 While employment status and salary level are factors influencing whether people use the internet or not, the February 2004 survey data reveals that among internet users, people from households with modest incomes find IM appealing. Nearly half (49%) of the internet users with a household income of less than $30,000 use IM. Again, this is probably tied to age, as young adults starting their work lives do not necessarily earn high incomes. Frequent internet users are likely IM-ers. Forty-three percent of internet users who go online daily have instant messaged. At the same time, years of internet experience seems to have little bearing on likelihood of IM-ing. This is a break with the pattern that Project surveys show in many other internet activities. Usually, experience is a strong predictor of whether someone does something online – including buying goods, listening to music, seeking information from government web sites, and banking online. comScore Media Metrix data show the most popular applications. AOL is a strong presence in the IM world, with its instant message service for subscribers and its free AOL Instant Messenger (AIM) and ICQ programs adding up to a dominant market presence, according to the most recent comScore data. At work places, Yahoo! Messenger is the single most popular application. During a summer month, when most students are not at school, half of college students used IM applications. There is notable variance among the users of different IM applications about the amount of time they spend online and the volume of IM-ers who use the applications on a typical day. Those who use Yahoo! Messenger spent more time during the month on IM – 423.7 minutes – than those who use other services. This might be the case because these IM users are the most likely to have an instant message application running while they are at work. The people who use MSN Messenger are the least likely to be online and the spent the least amount of time with the application running on their computers during the month.